Do you have a wee laddie that dreams of great adventures on the sea? 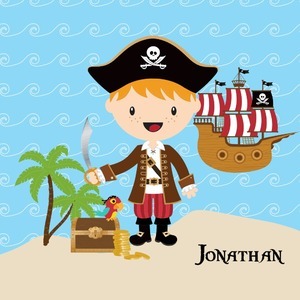 If yes, then bring his imagination to life with this great pirate design. Our little pirate is set on an ocean shore with his treasure chest, his pirate ship is set off in the background waiting for his return. Personalize this design with your little boy or little girl - his/her name, hair and skin color.